Not many filmmakers seem to care about visual comedy these days. You’ll find abundant sight gags (generally of a gross nature) in American movies, but true visual wit remains a rarity. Gore Verbinski displayed plenty of intricate visual humor in the Pirates of the Caribbean movies, but he’s an exception to the rule. The French filmmaker Michel Gondry (The Eternal Sunshine of the Spotless Mind and Human Nature) doesn’t always score bullseyes, but left to his own devices, as he apparently was in 2006’s The Science of Sleep, Gondry unleashes his capacity for amusing visual invention. Gondry’s Mood Indigo is based on a 1947 novel — L’Ecume des Jours — by Boris Vian. I’m not familiar with Vian’s novel, but after seeing Gondry’s movie, I have to believe that the director was inspired by a story that allowed him to pull out every visual stop — with substantial help from Stephane Rosenbaum, his talented production designer. The story: Colin (Romain Duris) has money and a quirky Paris apartment. Colin’s a bit frivolous, having invented a machine that he calls the “pianocktail.” This grandly silly instrument mixes cocktails when Duke Ellington’s Mood Indigo is played on it. Colin’s chef and chief advisor (Omar Sy of The Intouchables) whips up fantastical dishes for Colin and his best friend Chick (Gad Elmaleh). Turn on the faucets in Colin’s apartment and out come eels, an amusing, if less than appetizing, sight. Love looms. Chick meets Alise (Aissa Maiga) and falls for her. An envious Colin insists on falling in love, as well. At a party, Colin meets Chloe (Audrey Tautou). They dance together in a scene in which Gondry uses animation to enhance their limbs in rubbery, cartoonish fashion. Colin and Chloe also date, flying over Paris on a white cloud that looks like a swan and seems to have been borrowed from an old-fashioned amusement park. Gondry’s mix of live action and effects can be amusing and strange: The doorbell that turns into a mechanized insect that crawls the walls of Colin’s apartment, for example. Colin is such a good pal that he offers money to Chick so that he can marry his soul mate. As it turns out, Chick spends most of his time and a lot of Colin’s money acquiring valuable editions of the work of Jean-Sol Patre, a goof on ... well ... you know who. Gondry’s upbeat tone prevails right up to the time when Chloe contracts a Camille-like cough, a malady that stems from the fact that there’s a water lily growing in one of he lungs. Faced with losing the love of his life and his fortune, Colin drifts toward despair. Mood Indigo takes place over a fleet 92 minutes, but the non-stop invention inevitably loses some its charm, and the movie’s visual bric-a-brac proves so plentiful that it can feel as if it exists purely for its own sake. 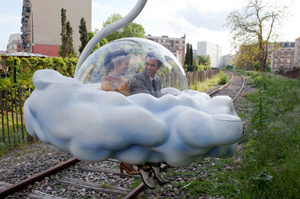 I liked parts of Mood Indigo very much, and I respect Gondry’s desire to ravish and entertain the eye. But like heavy rain on hot pavement, Mood Indigo tends to evaporate quickly, a victim perhaps of its own immoderation.